This American and specifically Philadephian surname is of Old Dutch topographical origins. It derives from the pre-medieval "Hilliger", and describes one who lived on a hill, a rare event in the flat Netherlands or Flanders. The surname is one of the earliest Dutch-American recordings dating back some fifty years (see below) before the War of Independence in 1776, to the prime period of British rule. 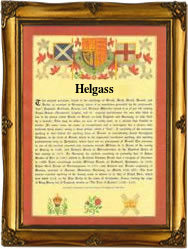 It is found in various spellings including Hilligas, Hellegas(s), Helleckas, Helgass and Hillicas; however, Hillegas would seem to be the original form. A Coat of Arms was granted to the nameholders in Holland, circa 1680; this was a gold shield, two iron tridents in saltire above a blue sea, indicating that despite the meaning of the name, the original nameholders were sea warriors. The name recordings include George Hillegass, who married Catherine Riechert at the First Presbyterian Church, Philadelphia, on March 3rd 1760, and Jacob Hillegas, who was baptised at Lancaster, Philadelphia, on September 17th 1779, during the War of Independence; he married Anna Maria Helpert at Somerset, Philadelphia, on June 1st 1808. The first recorded spelling of the family name is shown to be that of George Michael Hillegas and his wife Margaret (nee Hill), which was dated April 22nd 1728, witnesses at Philadelphia Reformed Church, Philadelphia, during the reign of King George 11 of the British Empire, 1727 - 1760. Surnames became necessary when governments introduced personal taxation. In England this was known as Poll Tax. Throughout the centuries, surnames in every country have continued to "develop" often leading to astonishing variants of the original spelling.